Please note your privacy is assured: e-mail addresses are never sold, rented, or shared. You need Silverlight in order to use the trial version of WhiteSky Studio. Silverlight is a free plug-in from Microsoft that you can download from here. You can click here to signup for a fully functional WhiteSky Time account here. This is completely free and means you can begin using WhiteSky Time today to design and run a system for your business. If you need more users or data storage you can contact us here to upgrade your account. The WhiteSky Time product is built upon our WhiteSky CRM template and powered by the WhiteSky Studio solution. There are plenty of timesheet systems available and it can be quite a task to compare features. WhiteSky Time provides cost effective and comprehensive functionality with peerless reporting. The major differentiating feature of WhiteSky Time is that it can be rapidly configured to reflect your fields, processes and terminology to ensure you get the maximum value. Simple & efficient time entry from any internet enabled access. Timesheet completion reminders and escalation procedures. Simple allocation of time to tasks and budgets with immediate alerts if limits exceeded. Efficient billing and invoice production (or file export to 3rd party system). Time forecasts and resource allocation information. Real-time dashboard configured to show relevant metrics. Flexible reporting by task, project, resource, chargeable and non-chargeable etc. Expense amounts and vouchers captured for project allocation and interface to accounting/payroll. Contacts: fee earner data and payroll information e.g. billing rates, holiday entitlements. Companies: Customer billing details and task budgets, staff allocations and reporting. Tasks: assigned fee earners, budgets, variances, billing and notes. 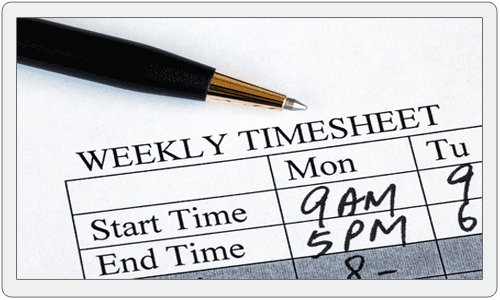 Timesheets: simple task selection, time entry and forecast.